This entry was posted in Blog and tagged social change on September 29, 2014 by Lauren Pearson. Maybe it really is no coincidence that academic organizations and arts organizations are on the same calendar. It always means that a new “season” of art launches at the same time that students return to school; it always means that the excitement of one can mutually propel the activities of the other. 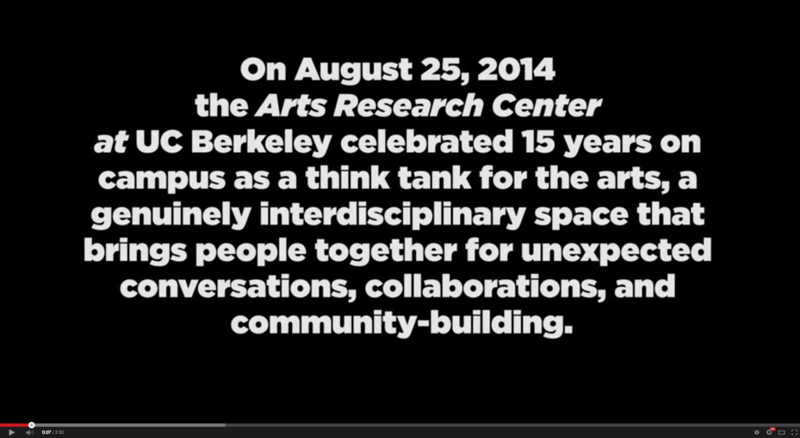 Once again this year, we at ARC were thrilled to be in the middle of all of it — and to launch a series of our own events that foregrounded the connection between the Bay Area arts landscape and the Berkeley campus. On August 25th, a few days before the first day of class, we were honored and humbled to celebrate the 15th anniversary of the founding of the Arts Research Center. 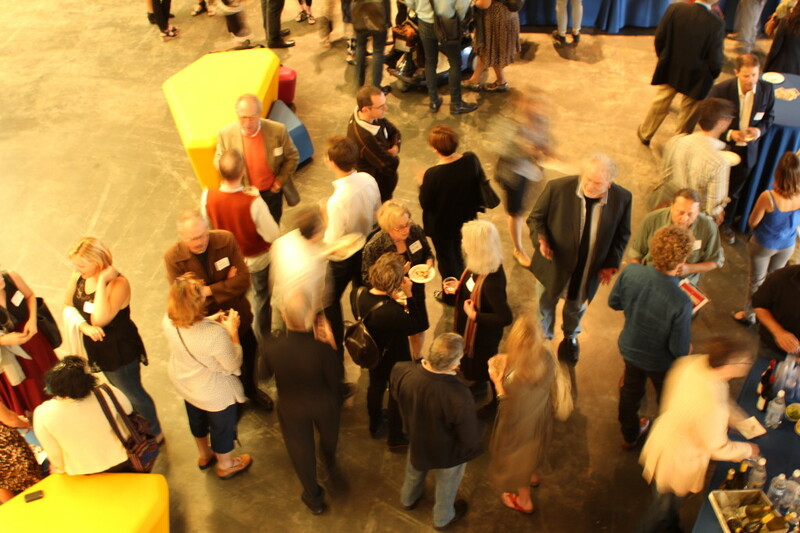 Located at BAMPFA with co-sponsorship from Dean Anthony Cascardi, we invited a crowd of our closest partners, supporters, faculty, and student fellows to toast our work together. It was a particular honor to have Chancellor Nicholas Dirks amongst us; the Chancellor offered a vivid, far-reaching, and heartfelt account of his vision for the arts on the Berkeley campus. 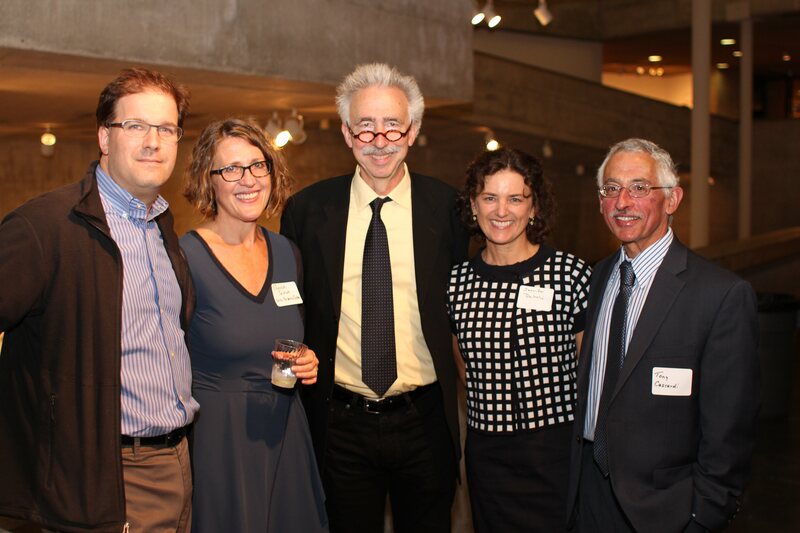 Left to Right: Cal Performances Executive and Artistic Director Matías Tarnopolsky; Arts Research Center Director Professor Shannon Jackson; UC Berkeley Chancellor Nicholas Dirks; Jennifer DeGolia; and Arts & Humanities Dean Anthony Cascardi. Image credit: Nick Randhawa. After such a terrific launch to the new academic year, we pressed ahead with new activities and collaborations throughout the month of September. As a nexus for the arts, the Arts Research Center does not simply seek collaboration; we are in fact defined by them. In true Berkeley fashion, we are no more and no less than the public partnerships we build with faculty, students, and organizations on and off campus. Advancing that ethos, this year’s Monday lecture series on Art, Activism and Technology started off with a bang, welcoming Grateful Dead lyricist and Electronic Frontier Foundation founder, J.P. Barlow, and the eminent artist, Maya Lin. Curated in collaboration with Berkeley’s longstanding Art and Technology Colloquium, co-hosted by the David Brower Center, this lecture series examines the legacies of the Free Speech Movement and will welcome some of the most prominent artists and curators working today. Indeed, September was a great month for at least two of those speakers. FOR-SITE founder, Cheryl Haines, installed and opened Ai Weiwei @Large “on the rock” of Alcatraz Island. And our Fall artist-in-residence, Rick Lowe, learned that he had won a MacArthur; we will celebrate with him in November by sharing the work of our students, faculty, and Bay Area partners in Richmond, Berkeley, Oakland, and San Francisco. At ARC, we know that a different kind of experience— and a different kind of work—can happen in smaller, more intimate groups. Hence, we were privileged to coordinate a closed workshop with faculty from the Haas ID Lab, TDPS and Art Practice to suss out unexpected synergies in our programs and pedagogies. September also reconnected us with a small group form that is near and dear to our hearts—the ARC salon. Berkeley faculty member and choreographer, Joe Goode, kicked off the first in this series of intimate conversations with Berkeley arts faculty. Goode offered our group a unique window into the how-to’s and wherefore’s of his process and his hugely influential career in the Bay Area. And on top of all of that, new Berkeley Art seminars launched, exposing incoming freshmen to the arts, and new students signed up as Civic Art Interns in our partnership with CalCorps and the Berkeley Cultural Trust. It is only one month into the academic calendar, only one month into the new art season. Yes, we are already panting…but we are also looking ahead for more. Click on the image to link to ARC’s Youtube Channel. Video Credit: Nick Randhawa.